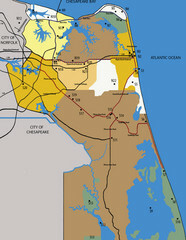 Tourist map of the Outer Banks region of North Carolina. Spans from Ocracoke, NC to Carrituck, NC. 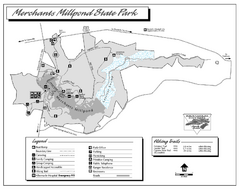 Shows lighthouses, golf courses, historical sites and memorials, and parks/refuges. 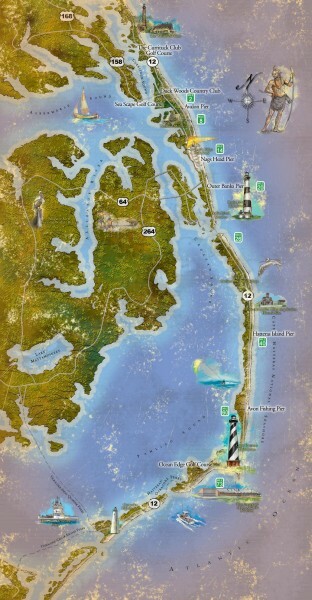 From outerbanks.org: "Surrounded by 900 miles of water, The Outer Banks has the largest estuary system in the world. Make sure to visit the wildlife refuges, maritime forests, the Cape Hatteras National Seashore and the tallest sand dunes on the East Coast at Jockey's Ridge State Park."